Writer/director Todd Bartoo discusses his supernatural thriller. Jamie Bernadette wants her revenge this April! Joan (Jamie Bernadette: All Girl’s Weekend, I Spit on Your Grave: Deja Vu) is an enforcer known for her ruthless tactics and wild abandon. After she is double crossed by her boss and left for dead, she becomes a vengeful spirit and is doomed to wander the Earth until she is able to take down the men that attacked her. 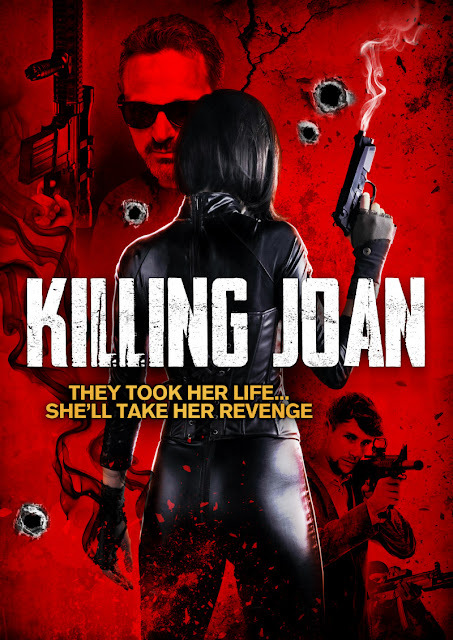 With eye-popping visual effects by Paul Lada (Prometheus, Harry Potter, Pacific Rim Uprising) and a superlative support cast including Teo Celigo, Erik Aude, David Carey Foster, Katarina Leigh Waters, Erin O’Brien and Daniel Gardner, Killing Joan is the film to die for this April. Available on Digital April 3rd and DVD July 10th. How would you describe Killing Joan? Killing Joan is an intense revenge thriller with elements of horror and the supernatural. And based on the genre, I presume fans – presumably younger – of the horror and supernatural flicks would be the target market? Maybe the odd action fan, too? There are a lot of elements that I think will attract people younger and older. Have you been surprised to discover a certain demographic or segment enjoying the movie that you didn’t expect to? I’d say the audience has been mostly male, but there have been a lot of female fans as well because of the strong powerful female lead character. Would you say it is reminiscent of any other film? Any films inspire it? Stylistically, it has elements of '80s and '90s horror from the likes of John Carpenter and Wes Craven. But it also has gangster elements from films of the '50s and '70s. There are influences from both The Crow, Death Wish, and I Spit On Your Grave. The revenge genre has a long history to draw from. For you as a director, are there any filmmakers you admire? Any of them inspire any of your directing choices on the movie? There are stylistic nods to Nicolas Winding Refn, Tony Scott and Michael Mann. There is a nod to Paul Thomas Anderson and Martin Scorsese in one scene where it is entirely done in one handheld tracking shot. Also, Wong Kar Wai was an inspiration in terms of how he tends to place his characters within an environment, lit by the neon lights of the city. If Killing Joan has one breakout star, whom do you think it’ll be? Personally, I think Pavle Mara is incredibly talented as George, the nephew to the mob boss. It was his first feature film as an actor but I felt he was perfect for the part, especially since he is playing a character that is in over his head, trying to act like he belongs there. And of course, Jamie Bernadette is great as the lead Joan. I think you will see sides to her you haven’t seen before. What do you hope the movie does for your career? What do you want out of this? My biggest hope is that people will find this film and enjoy it. For me, it’s a film that bears repeated viewing. There are things in there that people might not notice upon first viewing. I hope that people will still be watching it years from now. I also want to expand the universe of the film because there is a lot that isn’t in the movie. As a filmmaker, I hope to be able to continue making films the way that I want to make them. I hope that people can appreciate films that try to expand the genre and give you something different and unexpected but in a familiar wrapping.